The temple when we visited it a couple of years ago The Nandi is on the right. It is a thousand years since the first kumbabhishekam of the Brihadeeswarar Temple in Thanjavur was performed. King Raja Raja Chozhan who built the temple would have been pleased to see this occasion commemorated. 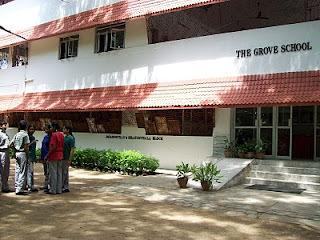 There were many celebrations including an exhibition and the release of coins and stamps by the Government of Tamilnadu. 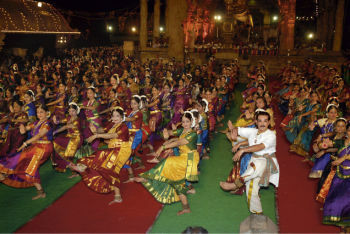 But one that impressed me most was the getting together of a thousand Bharatanatyam dancers to perform at this venerated venue (on September 25). Chennai Doordarshan carried the programme live and so did the webcast from kutcheribuzz.com. The dancers performed on the vast area around the huge Nandi. The area had been covered with coloured rugs/dhurries to form a kind of stage. I could spot among other well known performers Revathi Ramachandran, Srekala Bharat, actor Vineet, Narasimhachari and his wife Vasantalakshmi, and Swarnamalya. It was a tight squeeze for the thousand dancers, they barely had small squares of four feet to themselves. But how organised and disciplined they were, not moving out at all from their limited zones, but skilfully performing within their ambits. 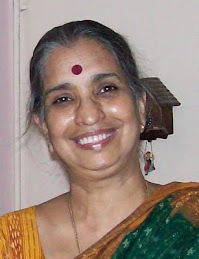 It was Dr. Padma Subrahmanyam, eminent Bharata Natyam dancer, who proposed the idea to mark the event thus. Who better? Dr. Padma’s research for Ph. D.was on the karanas (basic dance units of the Bharatanatyam) in the sculptures in the Thanjavur temple, the Nataraja temple at Chidambaram and the Sarangapani temple at Kumbakonam. The Rajarajesvaram temple, as it was known earlier, has beautiful sculptures of 81 karanas (108 karanas form the alphabet of the Bharatanatyam) on the walls of the floor above the sanctum, which were rediscovered about forty years ago. Though space had been earmarked for the remaining 27 karanas, they were not sculpted. Dr. Padma who was the the convenor, coordinator and organiser of the dance spoke of how the programme had taken form. She said that she had invited dancers by email and all of them had responded promptly stating their willingness to participate. Dr. Padma chose eleven verses from Tiruvisaippa, composed by Karuvur Thevar, the guru of Raja Raja Chozha, to be set to music. DVDs were made of the dances to be performed and sent to them. They practised following the DVDs. There was no rehearsal at all. To see them dance so harmoniously, one would never have guessed it. All the dancers had come under their own steam, and each of them was rewarded with a pendant, with an engraving of the temple, strung on a pearl chain. The compere who made the announcements was well-informed and well-read and his recital of some verses in Thamizh (of which my ignorance is abysmal) was impressive. He complemented Dr. Padma perfectly. Unfortunately I could not get his name. You can see him here with Dr. Padma from 25 seconds onwards. My disappointment the following day when I could not see a single picture in The Hindu, my daily newspaper, was great. 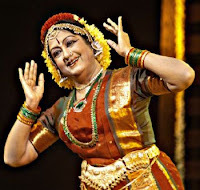 There was one of Dr. Padma with the Chief Minister, but that did not convey the idea of the grandeur of the performance. Having Dr. Karunanaidhi as the chief guest gave the event an aura of a different kind, and the programme must have gained by the cooperation of various government agencies. The next day, happily, there was a picture in The Hindu. I wonder how many other newspapers reported the event or carried pictures of it. See the webcast here: http://www.chennaistream.com/kb/thanjavur1000/. There are some uploads on the youtube too. Some enterprising person has alerted the Guinness World of Records about this event. The family is feeling very proud, and patting itself on its collective back - one of our clan is now a published writer. 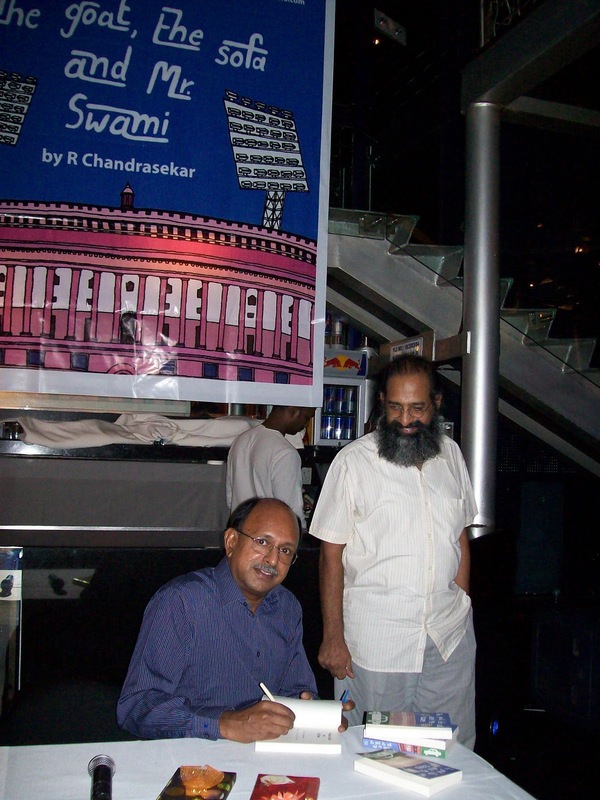 My cousin Sekar’s book, The Goat, the Sofa and Mr. Swami, has been published by Hachette recently. There was a book launch to mark the event, and what was to have been a modest crowd at the Pasha at The Park turned out to be a standing-room-only affair. My brother Raja, his good friend, ( in the picture above with Sekar) came down especially from Delhi for the event – and was pleasantly surprised to see his name in the ‘thanks’ page – a tribute to their friendship. 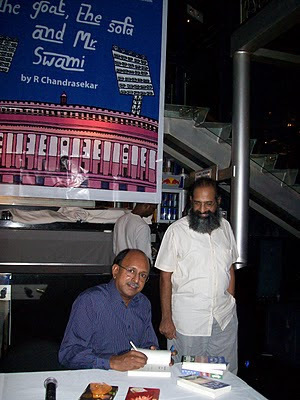 Tim Murari, a well-known writer from Chennai, was the chief guest on the occasion, but not having had time to read the book, since it reached him rather late for that, he could not offer any comment. His taciturnity was balanced by the friendliness of the crowd tossing intelligent questions at Sekar, who answered articulately and calmly. Sekar also read an excerpt from the book, making us want to read more. 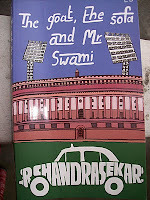 The book is an interesting read, and can be termed a gentle satire. The Pakistani Premier wants to visit India to see a cricket series, a dubious premise, but that sets the tone of this story, creating many absurd situations. 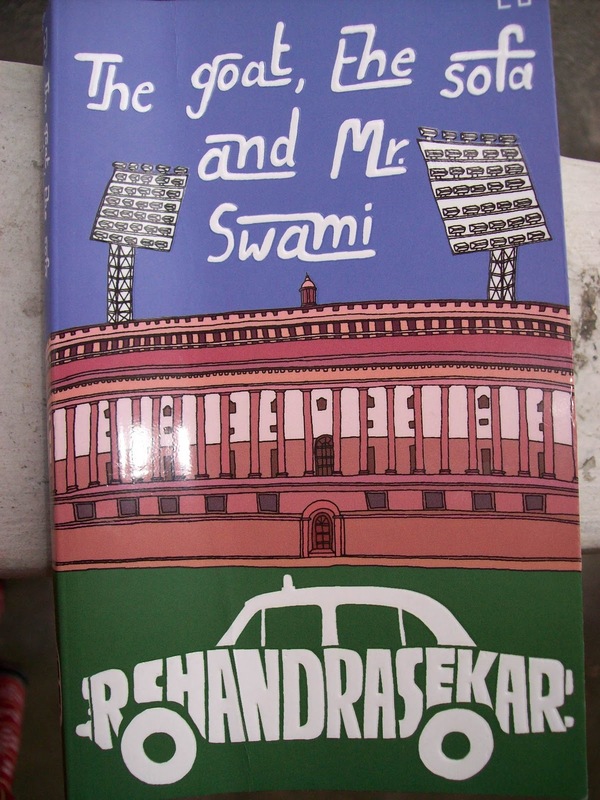 The novel is in the voice of Joint Secretary Swami, the Indian Prime Minister’s general factotum, and he narrates the story seriously without descending to the ridiculous. And I think that is where the writer’s triumph lies - the book is not farcical, while the state of affairs (affairs of the state?) is. Sekar (R. Chandrasekar) schooled in Mayo College, Ajmer, and studied in Vivekananda College here in Chennai and then in the Delhi School of Economics. 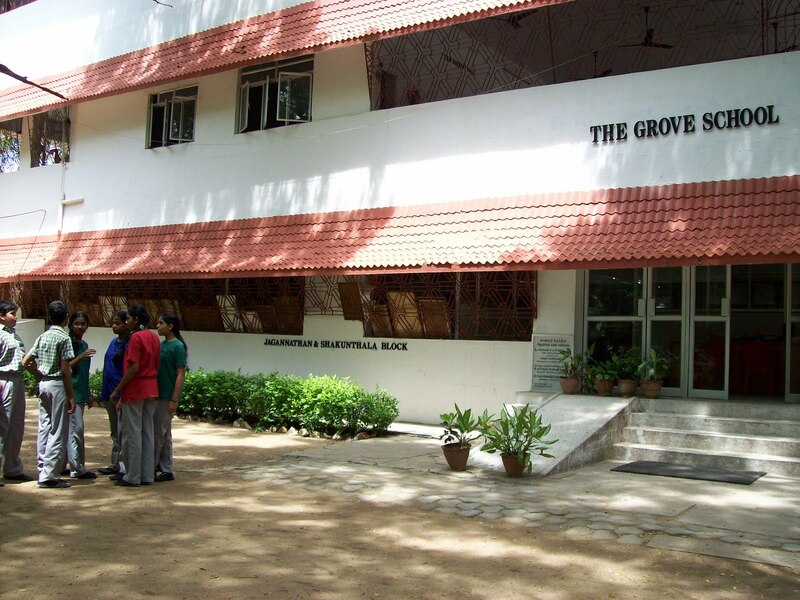 He went to the US and did a Masters from the University of Chicago, and worked there for some years before returning to Chennai and settling down. Here is wishing Sekar the publishing of many more books. There is nothing quite like a wedding to bring families together to share the moment and enjoy themselves. Very often, it is an excuse for a family get-together. It has been quite a while since there has been a wedding in our family. The last one was a nephew’s, almost three years ago. 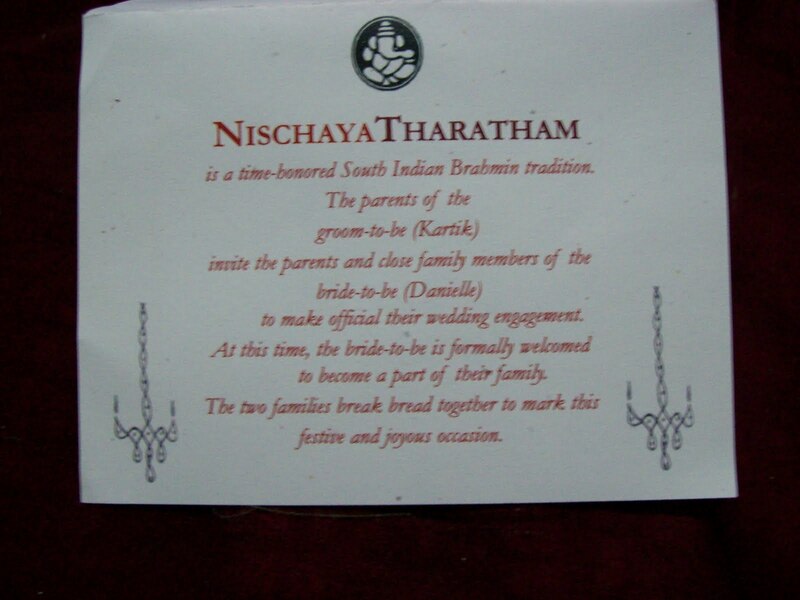 So it was very exciting when we learnt that my brother’s son Kartik was getting married soon to Danielle. My brother has lived in the USA for many years now, and his children were born and brought up there. The idea was well appreciated, he told me. Bala also mentioned both of Kartik’s grandfathers (who are no longer with us) in the invitation, making both grandmothers happy. 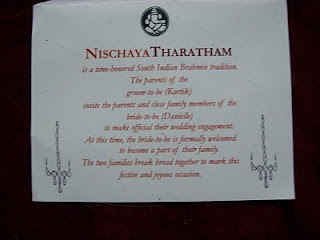 Most of us (family) are here in India, and we could not make it to the engagement; my son represented us on the occasion. But we hope to be there for the wedding next year. It was like a punch in the stomach. My eyes widened in shock as I read the mail from a blogger friend who lives in the US. He and his family had gone on holiday and lost everything except their passports after being mugged. This was a horror tale to beat all others. I dread anything to do with travel, and this seemed to be the ultimate vindication of my fears. I looked to see how we could help, but there was no plea or address for help to be rendered. won't let us leave until we settle the bills. Am freaked out at the moment. Then it struck me - why should anyone who is in such a desperate situation mail his blogger friends? Highly suspicious now, and remembering stories of similar mails sent by friends, or purportedly sent by friends, I decided to check it out. First I copy pasted the first sentence on to Google search, and saw that the very same words in the same order appeared in many references to ‘phishing’ or scam. A little comforted now, I called the number of the friend in the US. I was delighted when his wife answered, and told me that they were fine, and that they had had similar calls from others on their mailing list, asking after their well being. What had happened was this - someone had hacked into his account and sent the ‘phishing’ mail, and now he could not access the hacked mail account. Follow up mail from and to other blogger friends reassured everyone that our friend was ok. (Read his account of it here). To those who had answered the email, the hacker would send an address where money could be wired, that was the modus operandi. It was a relief to know that they were not caught in such dire straits, for it has been known to happen to people we know. When friends of ours living in the Middle East visited their son in New York, their luggage was stolen right from the hotel while they were getting themselves registered. Another couple we know had their bag containing their passports, laptop, cash, credit cards, watches and other valuables (not so many cell phones in those days) stolen from the restaurant of the hotel they were staying in – it was at Austria, I think. Though some things were recovered eventually, the joy of the trip must have diminished considerably. Last week I posted some pictures of a favourite view. I had a whole bunch, and though I would have loved to share them , it was just not practical to post them all. 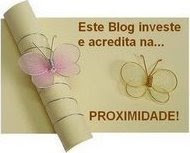 Blogger does not have a provision for a slide show within the post, so I had to make do with a small one on the sidebar, much to my dissatisfaction. So I turned to blogger pal Terry, and asked if he could help. It was a piece of cake for him I am sure, and here you have what he made out of my pictures. Today was the last day of my assignment - an assignment of six weeks that had taken only one hour per day, an assignment I had taken up without quite knowing how I had managed to land it. 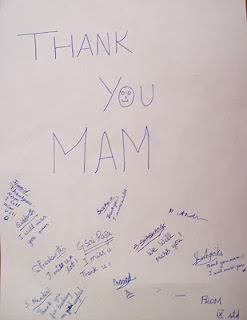 I had agreed to teach English (Language and Literature) to the students of Std. IX, at a neigbourhood school. The previous teacher had had to leave and they were looking for a replacement. A friend had recommended me, and when the Principal called and asked me, I somehow found myself accepting, on condition that I would be relieved by July 15, since I had some family commitments after that. Twenty years earlier, I would have welcomed a job like this enthusiastically, but right now, no schoolboy could have wended his way slower to school than me. A life of retirement, working at my own pace at my housewifely duties, or not working at all, had spoilt me, and I felt no desire to throw myself into the routine of a harried housewife who has to go to work. The Principal enticed me pointing out that there were only ten students, and supported me by arranging for the classes to be held in a spare room on the ground floor, instead of the second floor room, out of consideration for my creaking joints and grey hair. And so I started and it was interesting to be in touch again with the writers and poets whose works (I had been an English Literature student at college) formed part of the syllabus. I found I enjoyed teaching the youngsters, and interacting with them. They were intelligent, attentive, and eager to learn. But I wondered if they were happy with my methods, and getting the right learning from me - my teaching experience was dated, more than 40 years ago! After all they are going to write the Board exams next year. Today they set my fears to rest. They knew this was my last class. 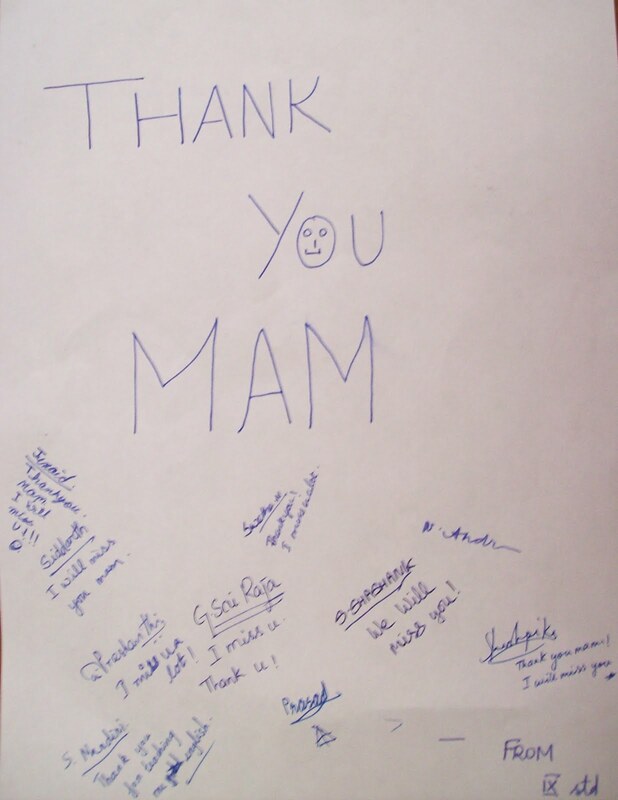 They presented me a ‘Thank You’ card made on an A4 sheet, and signed with all their names. “We want you to come back,” said one of them. “We like the way you teach,” said another, and when they all chorused “Yes” to that, I was touched. When I took leave of the Principal, she said that the children had told her they did not want me to leave. I felt that I must have done something right. Each one seemed to reflect a mood with the skies also changing colours dramatically and creating interesting backgrounds. Though we have visited our family before, it has always been in the summer. This was the first time we were there in the winter. 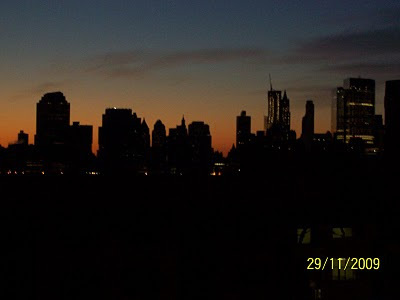 (Other winters I experienced were in Delhi which now seem comparatively mild, where I grew up, and in Manchester, UK where we spent a couple of years, comparable to the New York one).The cold was something terrible. Inside the building there was no discomfort, but stepping out made me miserable. Any exposed part would turn red and start itching. I would be well wrapped up, right up to my ears, but my cheeks and nose suffered. And what a winter – snowfall more than once in the season, even at the end of February, when our visit was coming to an end, and we though that the weather might turn warmer. 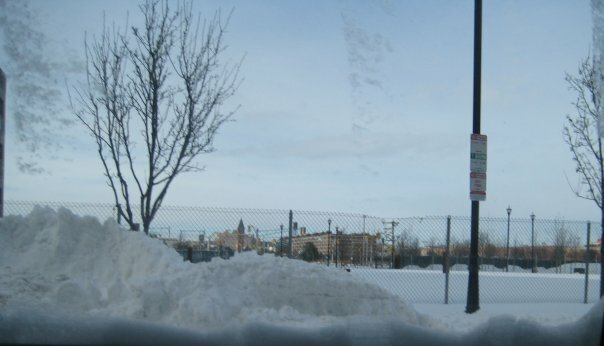 On one occasion we read that the snowfall was more than 12 inches. And we could no longer see the Manhattan skyline from the apartment. 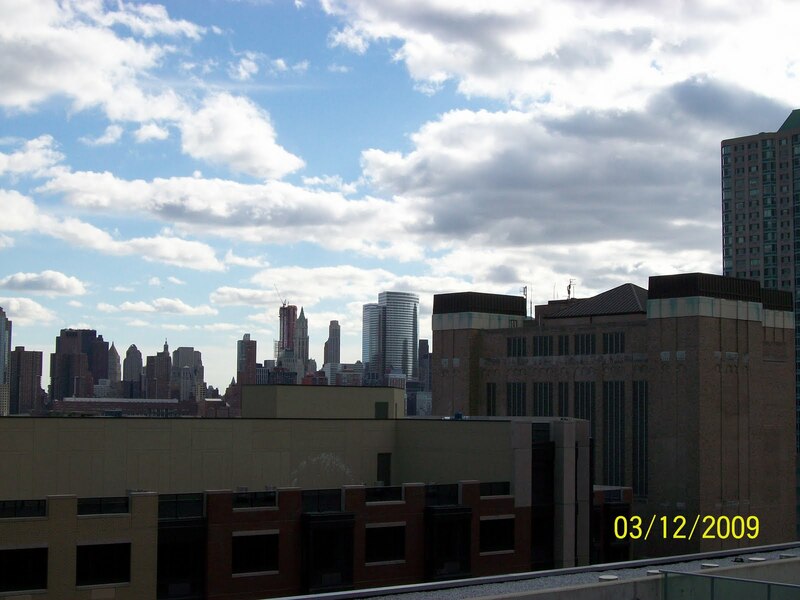 On a clear day you can see the skyline of a section of from the tiny balcony of our 10th floor apartment, or through the ceiling to floor glass windows of the living room. It was as though it had just disappeared. The balcony and the furniture in the balcony were totally covered by snow. We read of disrupted flights and stranded passengers, while we stayed warm and snug inside, thankful not to be out there. My son and daughter-in-law of course had to go to work, snow or not, and once Vandana even had to fly to Milwaukee overnight for a client meet. My husband wrapped himself up well from top to toe and trudged out as he did everyday, snow or not. I was content to stay home with Samyukta and admire it all from there. But one day, we did drive out to the city to take in the sights. The ledges and crevices on the buildings were loaded with snow, while the denuded branches of trees bowed down with the snow. We saw the snow banked up on the pavements, and workers cleaning the roads. When we got out to walk to Saravana Bhavan for brunch (yes there is one there, too) we had to squelch our way through the snow. 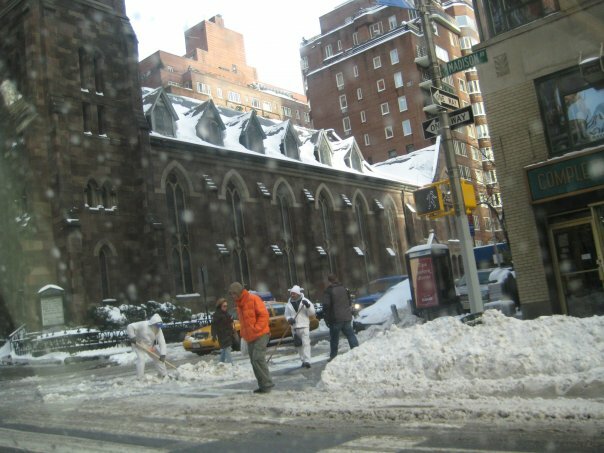 And then the snow was no longer white, but a slushy mess. ...and this is what the place looks like minus the snow. Daytime saw some brave youngsters falling about in the snow and trying to make snowmen. The skating rink in the neighbourhood was frozen solid, and there was fun and falls for the children , and some adults too. As I sit on our balcony here in the morning before it gets too hot, listening to all the birds – from the crow to the koel, sipping my filter coffee, I think about the apartment there, so warm and cosy, insulated from the cold snow outside, and so silent. No birds sang. My only connection to him was that our blogs appeared in the MysoreBlogPark. I read his blogs and left comments, especially about his photographs, which were really remarkable. And even that I haven’t done in the last few months. Because of this blog visiting, a kind of friendship via e mail developed between this young man who works in Bangalore, and me. He gave me tips about photography, which I tried to follow with my ordinary digital camera. (Well my husband’s actually – I gave it to him for his birthday so I could use it to take pictures for my blog!). But I don’t think I have been a good student. About 18 months ago he sent me an invitation to attend his brother’s wedding – a beautifully decorated card it was. A very sincere mail accompanied it requesting me to give my dates of travel so that he could meet and welcome us. Sweet as the thought was, we could not go. Earlier this year he contacted me to ask for my postal address to send me a calendar he had made using his photographs. 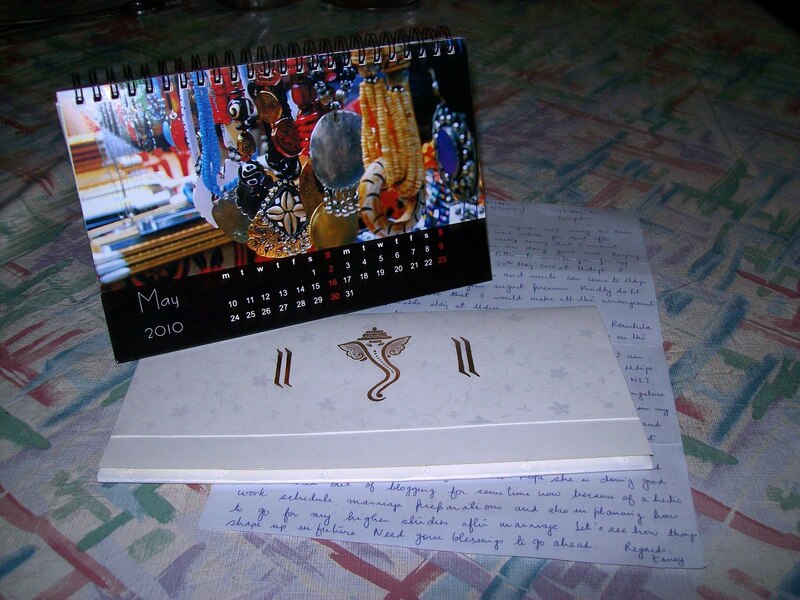 I was delighted to oblige, and the calendar arrived, accompanied by a beautiful and neatly handwritten letter. Whoever has the time or inclination to write nowadays? Everyone just dashes off e- mails or makes calls. Which is just what I did – I sent him an email thanking him for the beautiful calendar, when I couldn’t get him on the number he had provided on the envelope. I did not hear from him for a week, when suddenly another cover appeared from him. This contained, much to my delight, an invitation to his wedding, and another hand written letter in the same beautiful writing, with a sincere request to attend the wedding. 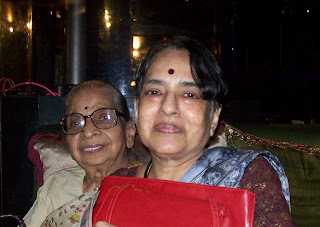 And also remembering to ask about Maiji, my mother whose blog posts also he used to read. He is getting married this month in Udipi to Nishka and then goes to his home place Rourkela for the reception. And what did I do? Did I write a nice reply wishing him and his bride? No, I called him on the cell number which he had thoughtfully included in the letter and wished him. Dear Tanay, I wish you and your bride a long life of togetherness and happiness. And hope to, as your blog says, remainconnected ! It is all baby Samyukta’s fault. Cuddling and cooing with her was my main occupation in the six months I was with her, and I developed an inertia and indifference towards everything else. 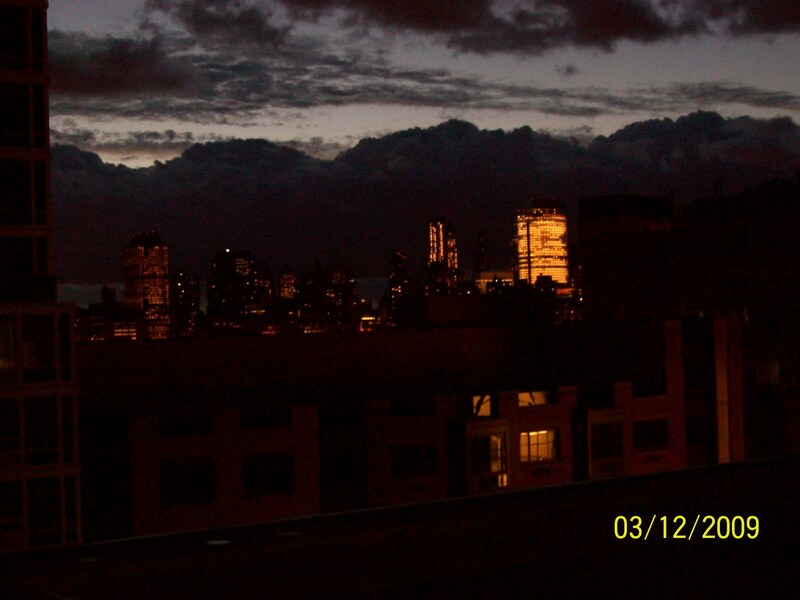 We returned two months ago, leaving her, and I found that the inertia persisted. 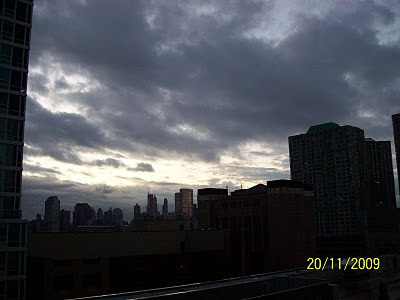 I looked at my blog post and found my last posting was in October last year. Not that anyone cares, I think, least of all me. And I had almost decided to stop blogging once and for all, like I did once before. But something happened which revealed that blogging, apart from a good exercise on the keyboard for arthritic fingers, and pandering to my own vanity, has a genuine worth. A couple of weeks ago my chat box on g mail popped out to show a guest on line – the chat box when accessed through the blog does not reveal the identity of the guest, but just cryptically says ‘guest’, with the dire warning “You are talking to an unidentified person, be careful what you say” or some thing very like it. I almost feel that it is like “Big Brother is watching”. The guest said “I was born in the house you lived in.” And I was nonplussed. To my knowledge the only person who was born in this house in Chennai where I live is my niece Swati, and she and I are well aware of that fact. At a loss, I decided to prod, and got some extremely interesting and satisfying answers. 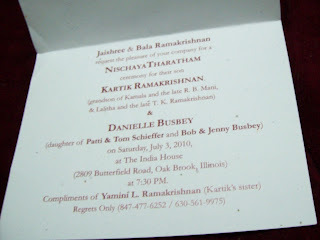 The guest, Tara, was born when her parents had lived in the same house that we had in Pondicherry. (See above). Her father had been my father’s immediate predecessor in the same government post, and so had lived there. Tara said she had seen my post on Pondicherry and had been quite excited. 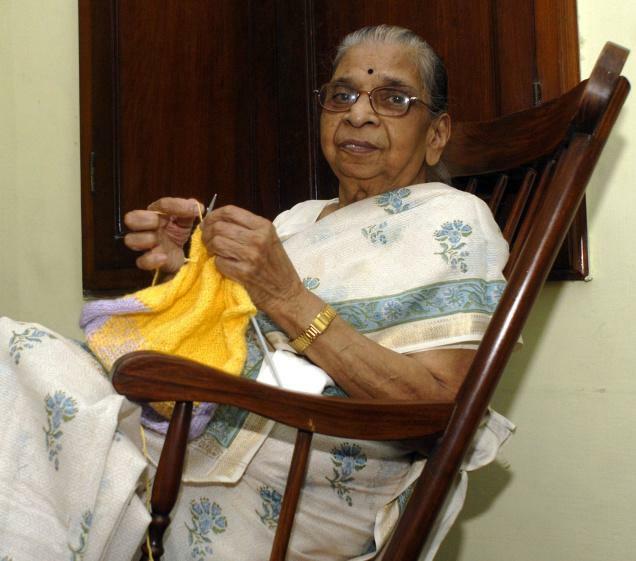 Though she did not remember much of her Pondicherry days, she said, her older sister Hema did, and her memories were quite like my own, including our school days. She asked for my phone number, and told me that Hema, who lived in the US, would contact me in ten minutes . And she did. We spoke for a long while. I could sense the excitement in her as she remembered her time in Pondicherry and I was happy to share the memories of our school and friends there. There is nothing quite like going back to a shared childhood, even if, as in this case, the days did not coincide. We talked about the house, and its live-in ghost, which fortunately neither of us had seen. And how we found the house and its surroundings so changed from the time we lived there. When I told my mother about this chat, she clearly remembered the family. And so after fifty years, and thousands of miles apart, a little blog post brought together two total strangers with a bit of common history. To quote the Terminator, I will be back!